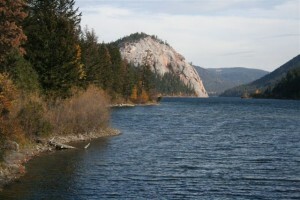 The Kamloops area has a number of recreational properties and lakefront real estate. There are many lakes surrounding the Kamloops area: Adams Lake, the Barriere Lakes, Heffley Lake, Knouff (Sullivan) Lake, Lac Le Jeune, Logan Lake, Nicola Lake (Merritt), Paul Lake, Pinantan Lake, the Shuswap Lakes and Stump Lake. Adams Lake: This beautiful lake is located 55 minutes north east of Kamloops or 30 minutes north of Chase. Adams lake is a very large sprawling lake where many visitors enjoy cycling, windsurfing, water skiing, wake boarding, swimming, canoeing and fishing. Many fish for kokanee and rainbow trout in this lake. 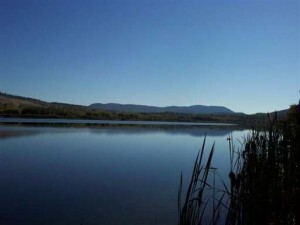 There are a number of properties on this popular lake often found on Agate Bay Road, Rawson Road and Holding Road. 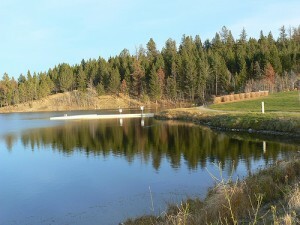 There is a large provincial park on Adams lake with basic campground facilities. To view homes for sale on Adams Lake click here. East and North Barriere Lakes: East and North Barriere Lakes are located 50 minutes north east of Kamloops and 15 minutes from Barriere city centre. North Barriere Lake is less developed than it’s neighbour East Barriere. There are a number of lots, residential and recreational properties for sale mainly on East Barriere lake.For more info about North Barriere Lake click here and East Barriere Lake click here. Little & Big Heffley Lakes: These lakes are very popular because of their close proximity to both Kamloops and Sun Peaks resort. 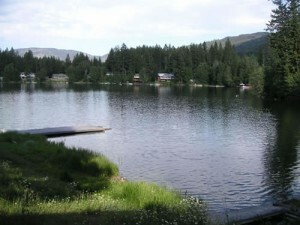 There are recreational properties on both Big Heffley Lake and Little Heffley Lake. Little Heffley lake does not allow power boats for water skiing or wake boarding as it is quite small. Big Heffley Lake does allow power boats which makes it a very popular destination for the summer months. Click here for more detailed information about Heffley Lake. Knouff (Sullivan) Lake: This lake is 40 minutes north of Kamloops and 30 minutes from the Sun Peaks Resort. Knouff or Sullivan lake is a quiet area where many recreational activites are enjoyed year round. This lake is more of a fishing lake. Water sports such as tubing and waterskiing are not commonly done on this lake due to the size. There are a number of waterfront and semi-waterfront properties on this lake. Click here for more information about this lake. Lac Le Jeune: Lac Le Jenue is located 25 minutes west of Kamloops, 30 minutes east of Merritt and 15 minutes south of Logan Lake. This lake is located off of the Coquihalla Highway making it easily accessible during all seasons. Lac Le Jeune is 392 acres and is stocked with rainbow trout. There are two resorts on this lake, numerous seasonal homes and also year round residences. To view properties and homes for sale on Lac Le Jeune click here. 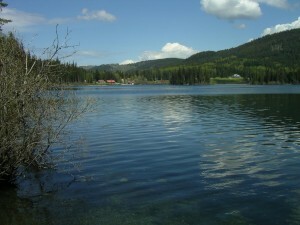 Logan Lake: This small lake is located 30 minutes outside of Kamloops and 40 minutes from Merritt. Logan Lake is a small community that has many services and amenities for it’s residents including numerous shops, restaurants, an elementary and secondary school. There are a number of winter and summer activities to enjoy such as golf, fishing, cross country skiing, snowmobiling, dirt biking, hiking and paddling to name a few. For more detailed information about Logan Lake click here. 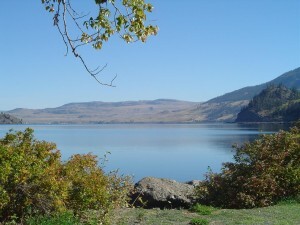 Nicola Lake: This lake is located in Merritt (10 km from city centre), and 45 minutes south east of Kamloops. Nicola Lake is a very large lake covering 15,351 acres. There are a lot of rainbow trout and kokanee for those who enjoy freshwater sports fishing. Windsurfing, canoeing, wake boarding, water skiing, fishing, hiking, horseback riding and mountain biking are a few of the popular activities enjoyed around this lake. There are a number of lots and homes that are located on the waterfront. To view available properties on this lake click here. 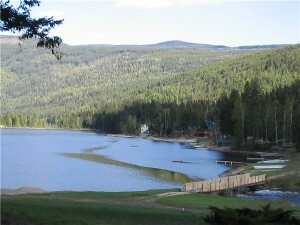 Paul Lake: Paul Lake is located 15 minutes east of Kamloops. Paul lake has numerous residents that are seasonal and year round. There are a number of townhouses (Deerwood on Paul Lake) and single family homes on the lake. Many of the single family homes and private properties on Paul Lake are leasehold properties which the Kamloops Indian Band leases out for 25 year terms. There are a few properties that are not located on leasehold land, but tend to be more expensive than the leasehold homes. There are a lot of activities to enjoy such as hiking, water skiing, wake boarding, fishing, swimming and paddling. For further information about Paul Lake click here. 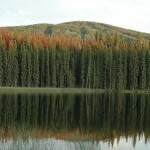 Pinantan Lake: Pinantan Lake is 25 minutes north east of Kamloops and 5 minutes past Paul Lake. The lake itself is two parts, Big Pinantan and Little Pinantan. The lake is 68 hectares in size. Pinantan properties are freehold properties not lease land. Only electric powered boats are allowed on the lake. Fishing and swimming are permitted in Pinantan lake. There are also hiking trails and other outdoor activities in and around the area to enjoy year round. There are often many properties for sale in Pinantan, lots, log homes, small acreages and lakefront homes. Click here to find out more about this area. 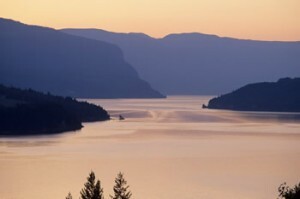 The Shuswap Lakes: Shuswap Lake is a very large lake network with numerous arms reaching a number of cities in the Interior. 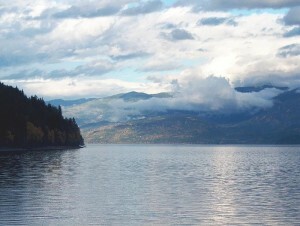 Shuswap Lake is named after the Shuswap Indians an Interior Salish tribe. This lake is the largest lake in the area with hundreds of kilometers of shoreline with hidden coves and beaches. 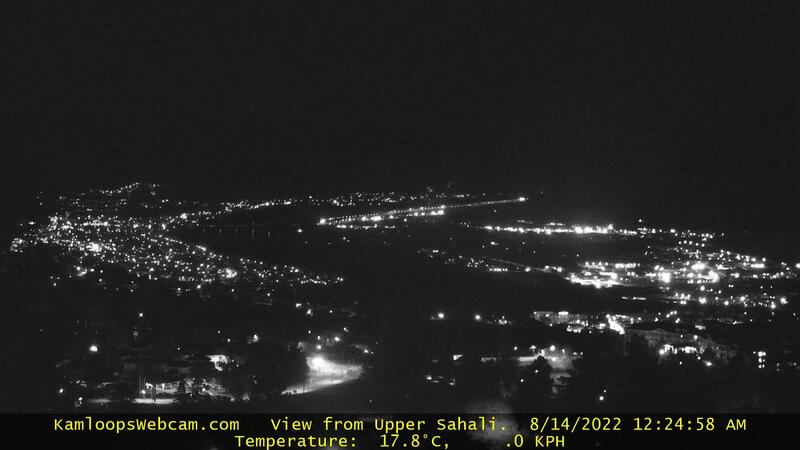 Little Shuswap extends off of the north western arm of the main arm of the Shuswap lake. The cities and communitites that surround the shoreline of this lake include Salmon Arm, Sicamous, Chase, Seymour Arm, Balmoral, St. Ives, Blind Bay, Carlin, Magna Bay, Scotch Creek, Eagle Bay, Notch Hill, Skimikin, Anglemont, Celista, Lee Creek, Sorrento, Sunnybrae, Canoe, Tappen, White Lake and Wild Rose Bay. Real estate in and around the Shuswap lake area is very popular for both year round and seasonal residents. There are a lot of beautiful building lots, apartments, townhomes, single family homes and estates that surround this large lake system. Since this area is so large there are often a lot of properties to choose from. Shuswap Lake has many summer cabins that sit on the desirable waterfront but not all areas are serviced by sewer and hydro. Click here to find out more about the Shuswap Lake area. Stump Lake: This lake is a smaller lake situated between Kamloops and Merritt on the Old Merritt Highway #5 and is 780 hectares or 1,927 acres in size. There are rainbow trout, brook trout and kokanee in this lake. This lake is relatively quiet during the summer months. Stump Lake does have public access to the lake to launch a boat or have a summer picnic. 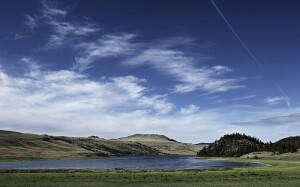 Stump Lake has a number of homes around the shoreline and in the surrounding hills. Many of the properties here are very peaceful, set in the wilderness and have beautiful views of the lake valley. To view homes for sale click here. 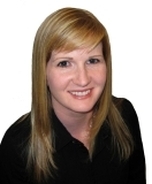 To search for lakefront homes and real estate in and around the Kamloops area click here.